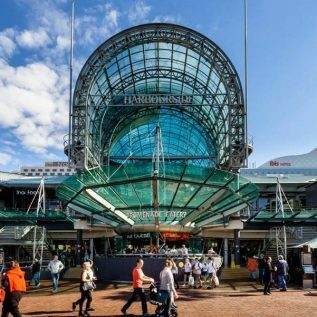 Harbourside in Darling Harbour is one of the most picturesque places to go shopping. The two story complex sits right on the shore opposite the city, giving a spectacular vista at night – at the shops are open until 9pm every day. The range of stores covers virtually every need with specialties including sports and outdoors; jewellery and accessories; liquor; footwear; fashion; stationery and books and lots more. Take time out in the food court, there are plenty of options. Or you can take a short stroll to one of the cafes or bars and have a leisurely lunch.